Curry leaves have a very special place in my heart. Growing up, we had to often change our residence because of my dad's work. Once such apartment was on the ground level and came with a dense garden around it. The garden had far too many plants that it blocked the sunlight and also eased the passage of bugs into our house. My parents trimmed out most of the plants but retained the Curry leaf tree. Mom was very happy to have easy access to fresh curry leaves even though she only used it for tempering dals. Soon some of the new neighbors started requesting for some curry leaves. They complained that the earlier resident had planted the tree and would guard it zealously, not sharing the bounty with anyone. My parents felt sympathetic and believed in the virtue for giving. They would graciously pluck a few springs and give it to all. Soon they got tired of doing it and asked people to pluck out the sprigs themselves. Later we realized that entire branches of the tree were getting ripped out. We didn't miss the curry leaves but felt concerned that the tree was getting harmed. We again started plucking chosen sprigs and offering people. But the branches kept disappearing everyday. Much later we learned that some people realized that these leaves fetch a good price in the market and we tearing down entire branches. My parents worked full time and with us kids at school, there was nobody to guard our tree. Finally the greed of mankind took a toll on nature. The tree which was in full bloom now stood bare. Slowly the tree died leaving me very sad. I wouldn't let my dad chop down of what remained of it. After a couple of years, we moved again and the new residents didn't want a stump on their front yard. It was sadly chopped down. I was very unhappy and also wondered - how would the earlier residents feel, they had planted a sapling and nurtured it into a tree. And now it was gone. Maybe they would blame us. Somewhere deep down i felt responsible for that tree. I never again owned a curry leaf tree and now living it North America, I miss it even more. Curry leaf is an indispensable ingredient in South Indian Cooking. I love its aroma but tend to use it only while tempering dals and chutneys. Most of the leaves wilt out and go bad even before I had a chance to use them. I have tried drying out and storing them but they always lose their flavor. Luckily I found this chutney recipe which is entirely made up of curry leaves. 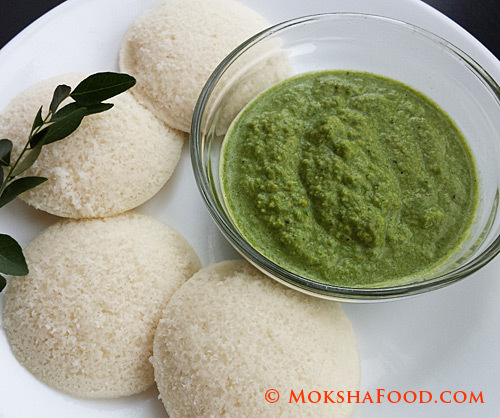 This curry leaf chutney goes very well with idlis, dosas, as a dip or even just spread on bread. It would also taste great in an Indian Italian fusion as a pesto added to your favorite pasta. In the same pan, roast green chilies and then the coconut till it browns slightly. Put the chana dal, green chilies and coconut in a blender. Add the curry leaves. garlic, salt, sugar and water and blend till it forms a smooth paste. 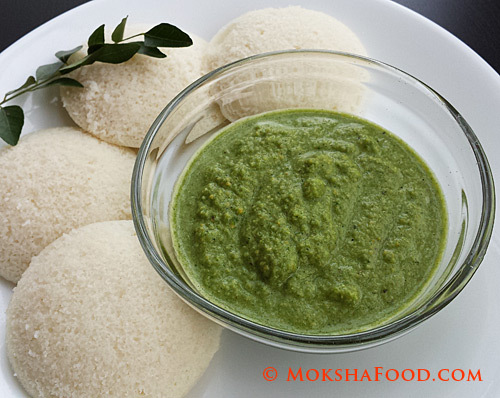 Chutney is ready to be served with idlis or dosa. TIP: If you like it tangy, you can add some lime juice or tamarind pulp while grinding.